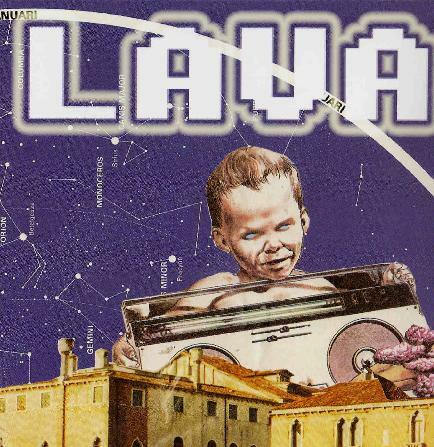 Lava is a Swedish band from Göteborg, Sweden with member in other bands like Uran, the Movements, and Den stora Vilan. The music is clearly quite improvised and instrumental with a lot of cool moods and very psychedelic at times. På Trotjtoren begins the trip with some cool synthesizers as the track picks up pace and the space rock begins. Trippy stuff. Glenn is next and is a very organ based track that gets quite spaced out and about 4 minutes in a more heavy guitar riff starts to build up. Great jam. T-Bone is something totally different now and it has a very psychedelic sound production and is very repetitive. I Håligheten is a short 1 minute piece with saxophone, creaking sounds, and a nice melodic guitar line. De lycklinga Mongot sounds like it comes out of this same jam but perhaps earlier or later, but the band are in a special psychedelic noodling mood now, but the jam slowly becomes more repetitive and circular and trips out. The CD ends with the 16 minute Lord of Linne, which starts very mellow and melodic and with a long organ solo and melodic floating guitars, but towards the last 6 or so minutes a heavy effected wind like synth sound sweeps in and dominates before disappearing. One of the guitar lines has a heavy riff going but he seems suppressed and the jam never goes in his direction, but the sound stays dense and psychedelic. A special band with a special sound. Space heads will dig it!